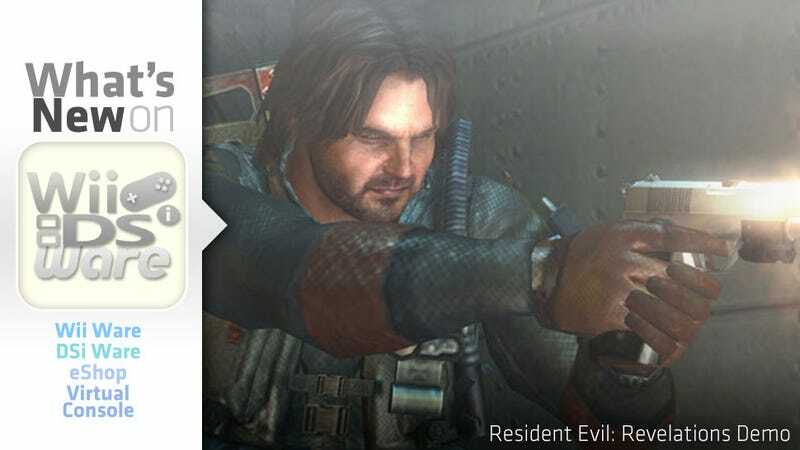 The Nintendo Download post normally showcases one of the many downloadable titles you can buy from WiiWare, DSiWare, or the eShop each week, but this week's all about try-before-you-buy as Capcom unleashes a playable demo of Resident Evil: Revelations for the 3DS. An entirely new chapter in the Resident Evil saga begins right here, right now. Due out February 7 in North America, Resident Evil: Revelations for the Nintendo 3DS sees BSAA agents Jill Valentine, Chris Redfield and Keith Lumley and their partners exploring an abandoned cruise ship. Their exploration leads them to a different sort of enemy powered by the new T-Abyss virus. Hopefully today's playable demo will be the start of a trend on Nintendo's eShop. Perhaps one day all 3DS games will score free demos. Meanwhile, over on WiiWare, Apline Studios has crafted an updated version of the 1995 first-person role-playing game Stonekeep, a name I never expected to hear again in a thousand years. It was lovely at the time. Now it looks...well, scroll down. Gaia's Moon for DSiWare doesn't look too shabby either, but a pretty face only gets one so far. Feel free to drop us a line in coments if you've played it and like it. Suffice it to say, if you own a 3DS, there's something you need to download waiting for you in the eShop. Go get it. Stonekeep. The legendary city was once ruined by a dark god's magick, but saved by your ancestors. Now the legend of Stonekeep requires a new hero: You. Explore dungeons, watch out for deadly traps, fight monsters with a variety of weapons or control dangerous magicks. The choice is yours. But all is not lost. There are allies within the halls of Stonekeep. Choose one to help lead you to victory. Fly through the fantastic skies of Gaia in this fun adventure. Something strange is causing changes to the balance of energy in Gaia that is necessary to prolong life. To discover the cause, you must play the role of Atreyu and his magical cane Milo, whose help you will need to be able to fly. But be very careful! The whole planet has gone mad and out of control, and existential chaos may ensue. The mechanics are simple: With a single button you provide the necessary energy to the cane "Milo", flying Atreyu through the sky of Gaia. Use your skills to discover who is behind this and return harmony to the Gaia system. There is no point limit; get the highest score in the ranking. You will also be able to challenge a friend in two-player mode, sharing the same Nintendo DSi or Nintendo 3DS system. Dress up a stylish doll by choosing from a wide range of Gothic-style dresses and accessories. Use the stylus to choose hairstyles, hair accessories, dresses, jackets and shoes, mixing and matching items to create hundreds of beautiful combinations. Once your doll is complete you can choose from various backgrounds and border designs to create a stunning picture with your doll at center stage. Alternately, you can set your doll against the background of your choice by taking your own picture using the Nintendo DSi™ system's built-in camera. You can further decorate your doll by adding stars and other pretty effects or by drawing freehand. Your completed doll pictures can be saved to an SD Card (sold separately), traded with friends, used on social networks or printed out from a computer. Built from the ground up to take advantage of the Nintendo 3DS features, Resident Evil Revelations delivers an exceptional survival horror experience with outstanding visuals that bring the fear to life. Resident Evil Revelations introduces a brand new storyline, locations and characters to the series, including playable characters and BSAA members Jill Valentine, Chris Redfield and Keith Lumley with their partners Parker Luciani, Jessica Sherawat and Quint Cetcham. Jill Valentine and BSAA partner Parker Luciani have been sent to search for Chris Redfield, whose last known GPS data positions him as being onboard a supposedly abandoned cruise ship. Danger hides around every corner as they explore the confined space of the ship and face a menacing new enemy and virus; the T-Abyss. In a brand new mode for the series, Raid Mode will offer players a different kind of experience separate to the main campaign story in either solo or co-op play. Compete in a variety of missions to defeat enemies and level up your character and gain more powerful weapons. Earn points for the enemies you attack and select from a range of upgrades to improve your weapon's performance. There's money to be had, and it's waiting to be nabbed. Be an ace in Lock‘N Chase. This classic arcade game invites you to play as a thief who's trying to score big by collecting his weight in gold. Duck in and out of alleys while scooping up coins along the way. Maybe you'll get lucky and find some extra treasure. But being on the wrong side of the law is never easy, as the police are hot on your tail. If you think they're coming too close, try using a sliding door or power-up items to block their chase. Think you can make a clean getaway? Test your skills in Lock‘N Chase.